A proposed increase to the cost of the Foundation Year program by $1,000 was unanimously struck down Thursday by the Board of Governors at the University of King’s College. The tuition would have increased the first year tuition to $9,878 for King’s students. The national average according to Statistics Canada in 2015/16 school year was $6,191. The proposed increase was the result the province’s last budget which included deregulation of tuition for out-of-province and graduate students and a one time tuition increase allowed at the unversity’s discretion. It was proposed the price increase would help with financial struggles the university is facing due to decreased enrollment, which dropped from 972 students in 2015 to 883 this year. King’s president Bill Lahey, was officially installed as president on Thursday. He says the board of governors voted against the reset on the grounds that it would make recruitment more difficult and the financial hardship the increase would have caused for students. 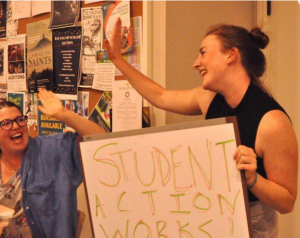 President of the King’s Students’ Union, Aidan McNally (right) celebrates what she calls a victory for the student movement Thursday. “We can really see this as a success for the student movement,” says Aidan McNally, president of the King’s Students’ Union. The KSU along with the Canadian Federation of Students has pushing hard for more accessible post secondary education. He says his conversations with McNally and student demonstrations – sidewalk chalk, student rallies and tabling on campus – have had an impact on his ideas. The students’ actions helped speed up the decision so that it happened on Thursday and was not postponed. McNally is thrilled that after months of organizing, the students have succeeded. She says students took time Thursday in between classes to chalk messages on the pavement in front of the university explaining how tuition fees negatively affected them. Some of the messages spoke of what students couldn’t afford like healthy food because of the price of tuition, or their need to work two sometimes three jobs while studying. McNally hopes she and the Canadian Federation of Students can carry this momentum forward for their Day of Action where students go “all out” on the streets, marching to protest high tuition fees on Nov. 2. “We can leverage out collective power and influence decision-makers to make free and accessible education a reality,” says McNally.